What are the logistics implications of the July 6 tariffs? Will an all-out trade war wipe out over half of global trade? Chinese and US tariffs are set to come into force on July 6. Both Chinese and US air freight export volumes look particularly exposed. This may be the tip of the iceberg however in a conflict that could ultimately wipe out over half of global trade. In the whirlwind of daily rhetoric and announcements, one can be forgiven for losing track of what has happened so far in this year of trade uproar. Thankfully, this article provides an excellent summary table of key tariff flashpoints. It details the imposer, target country, product(s), tariff rates and whether the tariffs are already in force or have just been threatened at this stage. In a nutshell, tariffs imposed to this point have been relatively small fry. The real fireworks start on July 6. From that day, both China and the US have identified more than $30bn of goods that they trade with each other which will suffer tariffs of 25%. 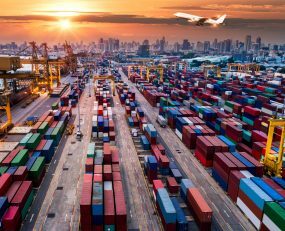 What are the logistics implications of the July 6 tariffs? Hundreds of different products are being targeted by both the Chinese and the US. The lists both countries have drawn up however are quite different. The US list, which amounts to $46bn of imports from China (8.8% of the trade lane’s total value in 2017), heavily features manufactured goods. In fact, this analysis by the Peterson Institute suggests 95% of the products are intermediate inputs or capital equipment. While this will adversely impact supply chain volumes throughout Factory Asia, there is no doubt that the US and Factory North America will be hurt by the policy too. Expect to see more stories of the Harley Davidson variety. While the share of containerised sea freight tonnage on the lane under threat is not far off from the trade lane’s value share of 8.8%, the share of air freight volume that the goods subject to tariffs account for is drastically higher*, with machinery and electronics making up the bulk of this. The Peterson Institute conducted a corresponding analysis for the Chinese tariff list. Its tariffs will affect $34bn (29%) of the total value of goods on the US to China trade lane, although the Chinese have clearly targeted goods which will impact their own export supply chains much less. Just 35% of goods are classified as intermediate goods or capital equipment, with 38% being agriculture and food products while 24% is transport equipment. Unlike the US, the Chinese appear to have carefully considered goods which will have fewer supply chain knock-ons. For example, soybeans, cars, petroleum oils, propane, cotton and grain are some of the key goods being targeted. Overall, around 65% of total sea freight tonnage on the lane will be subject to new tariffs, far higher than the value share of 29%. Conventional air and ocean forwarders can breathe something of a sigh of relief however because the shares of containerised sea freight and air freight under threat are considerably lower than 65%. * You would certainly not however want to be a US air freight forwarder highly exposed to perishables. Could an all-out trade war wipe out over half of global trade? This recent article by economist Paul Krugman put some interesting numbers around the impact of an all-out trade war (worst case scenario). He states: “There’s a pretty good case that an all-out trade war could mean tariffs in the 30-60 percent range; that this would lead to a very large reduction in trade, maybe 70 percent; but that the overall cost to the world economy would be smaller than I think many people imagine, maybe a 2-3% reduction in world GDP. In something of a reassuring rebuttal on Twitter, the man who literally wrote the book on modern globalisation and trade, fellow economist Richard Baldwin, asserted that the figure of 70% is too high. In any case, even if the figure of 70% is anything close to being correct, freight forwarders and carriers would be financially decimated. To put this into context, the crash in 2009 saw global trade volumes contract by 12% in real terms.